Today a friend mentioned the name Joseph Cornell – American artist and sculptor (1903 -1972). I had not thought about him in a very long time and yet at university I was obsessed by Joseph Cornell’s boxed assemblage work. Hearing his name prompted me to look for images of an artwork I made around 1992 titled, Shared Living. This artwork was influenced by Cornell and touched on Gaston Bachelard’s notions about the house and self. Shared Living recounts a time when I was a student, living in a share house in Victoria Park, Perth. It was a strange rental house with a lot of old furniture either in the house for us to use or locked upstairs in the attic. While viewing the house as prospective tenants my friends and I asked the landlady what was in the attic. She casually told us, “Oh nothing, just Grandma’s hair”. Thinking we misheard her, one of us asked again only to hear the same odd reply. Needless to say, we picked the lock on the attic door as soon as we secured the house keys. In the attic we saw old newspapers stacked high, antique furniture, old phones, photographs and most memorably a drawer full of long dark human hair! The narrative in this artwork centres on the mysterious Grandma and myself. Two strangers and yet two women who have occupied the same space: viewed themselves in the same mirror and dreamt under the same roof. The top left windowpane depicts Grandma reproduced and screen-printed onto the glass from an original photograph hanging within the house. On the bottom right windowpane is my passport photo surrounded by a suitcase to indicate my transience. The suitcase was replicated onto little swing tags and attached only to objects owned by me. Maybe my younger self thought this artwork would somehow honour her memory or keep her ghost at bay? The house WAS spooky! 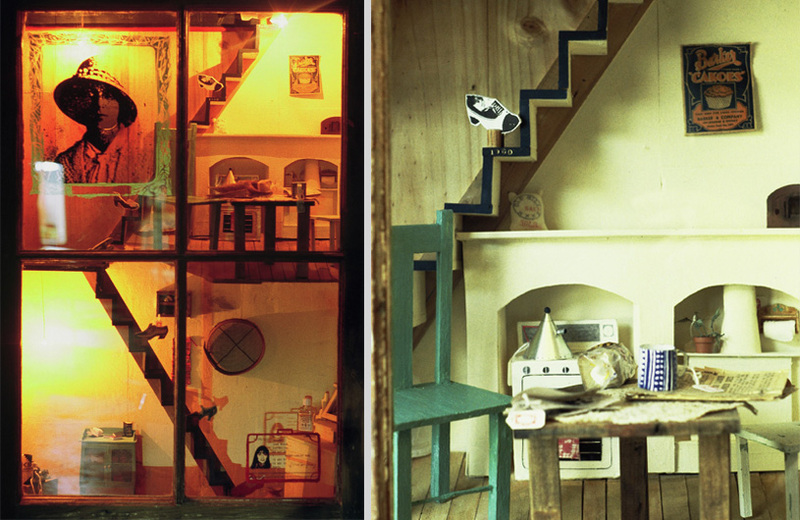 There is an option to turn on tiny electric lights within the dollhouse-like construction giving it a light box effect (as seen in the left image above). On opening the hinged window I wanted music from two different eras (hers and mine) to play like a music box but that kind of technology was beyond me at 20 years of age. Various objects throughout the house were replicated in balsa wood or paper and then painted. Little screen-printed shoes ascend the stairs like board game tokens and depict shoe fashion through the ages. They march towards their resting place in the attic. Shared Living was approximately 1m in height. Sadly my own Grandmother got tired of storing this large artwork for me when I was away travelling. She mistook it as junk and it ended up in a skip bin.